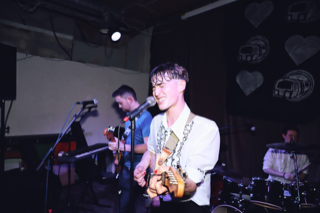 Thursday night saw established four-piece The Vignettes pulling in crowds to fill up the ever-romantic pub and music venue The Old Hairdressers in Glasgow city centre, to celebrate the release of their first 7” single, Subway Romance. With support from both Yung KP and Quiche – both hailing from Glasgow – the evening avoided any sort of lull in energy from the get-go. The Vignettes put on the event working in tandem with filmmaker and sound engineer, Ewan Grant, to encapsulate their vision for their latest release, and resultantly delivered a distinctly charming evening which saw homemade pamphlets handed out to all, the availability of Single, Return or Advanced tickets to be purchased prior to the event, and their symbol emblazoned on the walls of the venue in old subway tickets. The band bring something different to Glasgow, demonstrating the eclectic, idiosyncratic nature of themselves in every way they perform. Their frontman, Hamish Swanson, is an encapsulation of all the band translate in their image; eccentric and outlandish without being garish or inaccessible, and absolutely passionate throughout – wringing with sweat and beaming by the end of it. Guitarist Innes Mackintosh also took a share of the vocals on certain tunes, providing a pleasant switch up in tone for parts of their jam-packed set. The audience seemed to lap all of it up anyway, clattering and clambering over each other and firing glowsticks all over the place, it’s fair to say they went down exceptionally well, with cries for an encore being satisfied by the four piece who carried the room into their last last tune with ease. The Vignettes latest single is out now, a solid marker of what they’ve achieved thus far, and a mere taste of everything else they have to offer, to throw at us, to throw themselves into. Next Can Theatre Ever Be Apolitical?